As a true Muslim in our lives we strive to believe in and praise Allah (swt), with a paramount and ultimate goal of getting admitted into Paradise (Jannah). Hopefully that our lives hereafter will be in Paradise, and naturally we all are very eager about to know what Paradise is like. The Quran describes people about Paradise, it will be granted by Allah(swt) to them, and indicate its beauties to all human beings. Actually the reality of Paradise cannot be understand until and unless people enter into it, but Allah (swt) has revealed some of its glimpses in holy Qur’an. 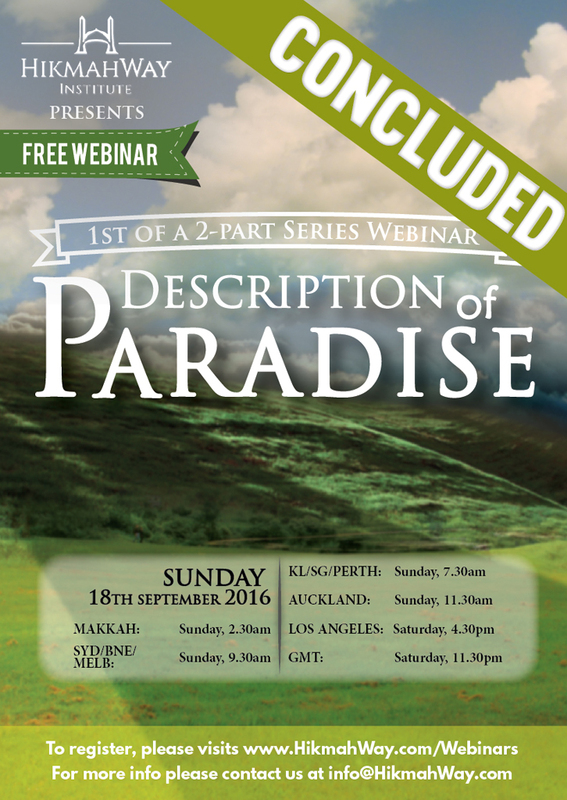 Let us join this joyful journey (Free Webinar) and try to feel the unmatchable & unimaginable glimpses of Paradise mentioned by Allah (swt) and His Prophet Muhammad (saws) in the scriptures.